Having a mess-free home while raising kids is not easy, but the hard work is on the front-end during the decluttering and eliminating that you need to do before you can really get started. 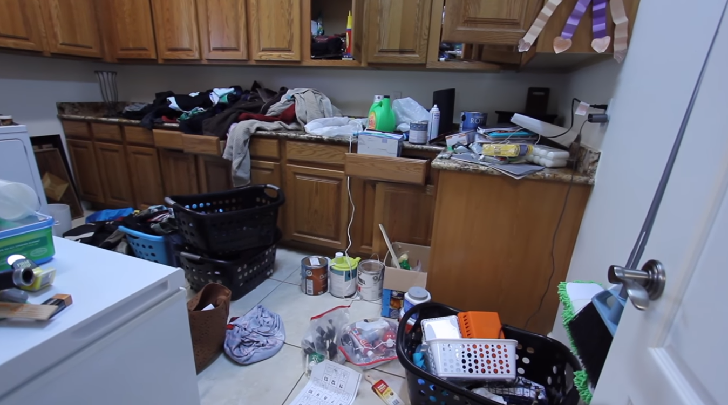 Do you feel like you can never keep your house clean? Everywhere you look, you see toys left out? Does it seem that you minute you pack away the broom and dustpan your kids inevitably leave a trail of cracker crumbs not five minutes later? This was our home too. Until I snapped. I know for some, it may seem a bit of a contradiction for the people who made the mess to also clean the mess. But we have decided to try something new in our household a few years ago and we have never looked back. We have 3 kiddos in our household and to clarify, we have 3 boys. We are lucky enough that the kids don’t produce mass clean up jobs anymore. The kids are great at picking up a toy or two or rearranging their toy boxes but the cleaning we have decided to include them on is much more than light pick up tasks. We wanted to show the kids that messes that are made need to be cleaned up. We also wanted them to understand accountability and understanding that in our house, everyone can help out. So, here’s the scoop! Younger kids; 5 and under are usually more eager to help. At first, I didn’t know if I wanted to trust a child so young with organizing large projects, such as cleaning out the basement. And I was right, he mostly takes out toys or constantly pulls things out of boxes due to his inquisitive nature. So, that was not a win in my book. However, he was great at taking objects I needed to move upstairs and placing them in a designated location. Next, my husband usually coaches the kids on trash duties every Wednesday. They know to locate all the trash and dump them into a bigger bag then to take them to the trash can outside, when they are finished they also know to wash their hands. Now, one of the biggest things in our home is washing clothes. 3 kids, 1 husband = Enough clothes to open up a department store. I am pretty great at letting go of clothes once they have reached their useful life. But for the kids and my husband, it’s hard to let go of clothes. With that being said, all of those clothes eventually need to be washed. Every week or so there ends up being a mountain full of clothes. The kids will all gather together to separate the clothes in their room and bring them down to the washer. Once that is complete and the clothes are washed, our 5-year-old is able to fold easy things like blankets and towel and jeans. While the other kids are laundry folding machines! Soon after, I instruct the kids on where to take the clothes– and that’s where the magic really begins! Its such a sight to see when a family works together.